After a third-place finish last year, D.C. dropped to fourth place on this year's "ParkScore" index, which is compiled by the Trust for Public Land. The score card tallies up parks and other recreational amenities — such as the number of dog parks and playgrounds — and the percentage of residents who live near them, among other factors. WASHINGTON — The nation’s capital continues to have one of the best public park systems in the country, according to a newly released score card from a nonprofit that advocates for parks and protected land. But the grass is getting just a bit greener in the Midwest and on the West Coast. After a third-place finish last year, D.C. dropped to fourth place on this year’s “ParkScore” index, which is compiled by the Trust for Public Land. The score card tallies up parks and other recreational amenities — such as the number of dog parks and playgrounds — and the percentage of residents who live near them, among other factors. Arlington, Virginia, fell from fourth place last year to sixth place. For the second year in a row, Minneapolis ranked first and Saint Paul came in second. Meanwhile, San Francisco leapfrogged over D.C. — from fifth place last year to a top three finish in this year’s score card. Alexandra Hiple, a research associate with the trust, said D.C.’s dip in the rankings came because the top cities simply outperformed D.C., not necessarily because of any changes in local parks. “Both of those drops are just due to some other reshuffling by other cities that jumped ahead of them,” she told WTOP. Spending on parks per resident by local governments. In addition, the score card also factors in the number of basketball hoops, dog parks, playgrounds, and recreation and senior centers per resident in each city. “Those four amenities are important, because they serve a whole breadth of citizen needs — everybody from really young kids all the way up through the elderly population,” Hiple said. 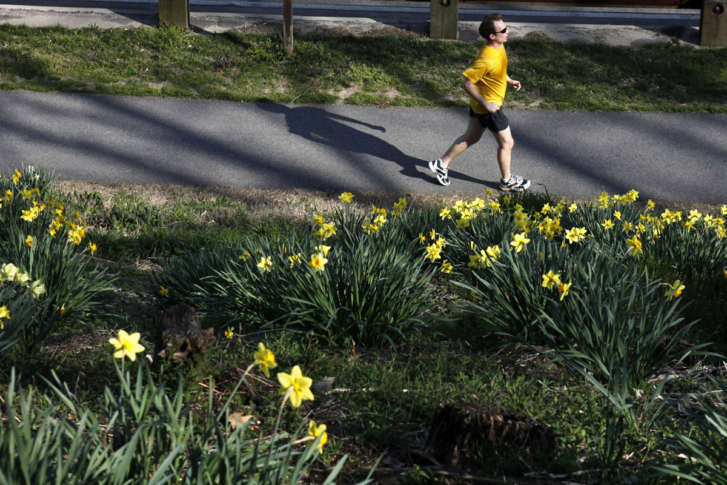 In D.C., 97 percent of residents live 10 minutes or less from a park. That’s well above the national average of 66 percent. But San Francisco, which ousted the District from the top three, became the first city with 100 percent of its residents living within a 10-minute walk of a park, according to the rankings. D.C. also outperforms the average in the number of dog parks per residents but underperforms when it comes to playgrounds, Hiple said. “That would be an area that D.C. could improve and possibly boost its score in the future,” she said. In D.C., about 22 percent of the city area is reserved for parks, according to the index. Again, that’s above the national average of 9.3 percent. However, the median size of a park in D.C. is much smaller than the national average. The median size of a park in D.C. is just 1 and 1/2 acres compared to the national median of 5 acres. Meanwhile, in Arlington, 98 percent of residents live near a park, and 11 percent of the city area is reserved for parkland, according to the index. Overall, the score card aims to highlight the importance of parks in creating healthy communities and the importance of cities maintaining investments in them. Spending on parks in D.C. clocked in at $270 per resident — a slight decline from last year. “Even a city that has almost always done really well with their park system … it’s definitely a time for city leaders to still be thinking proactively and creatively about keeping up with their system,” Hiple said.